A man dubbed as 'French Spider Man' has scaled one of the tallest skyscrapers in Manila on Tuesday ( Jan.29). Passers by and office workers was shocked when they spotted a man climbing a skyscraper without safety harness. 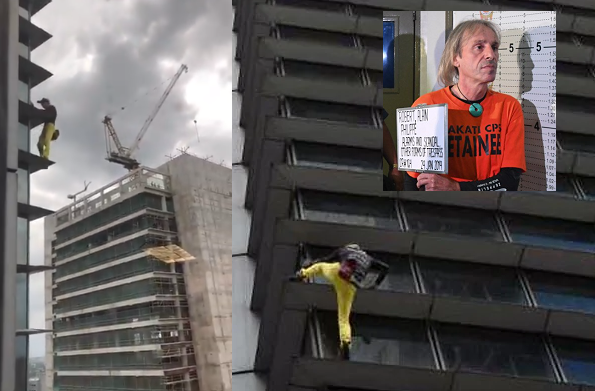 The 56-year old climbed the 47-storey GT Tower shocked people around the area seeing right before their eyes which they quickly recognized as viral 'Spiderman,'Alain Robert. However, as soon as he reached the ground, Police are waiting to him and was held on a charge of public disturbance and was awaiting a decision from prosecutors on bail. Robert is a notorious for his daredevil stunts with an impressive record conquering the Eiffel Tower, the Sydney Opera House, Kuala Lumpur's Petronas Towers, New York's Empire State Building and the world's tallest tower Burj Khalifa in Dubai with 2,717 ft (828m). Robert has a record of more than 100 structures climbed without using ropes or other safety equipment which recognized by Guinness World Records for "most buildings climbed unassisted".